Approximately one in four of us will experience a mental health problem each year in England. As part of our fight against this, we have a very much underutilised tool - food. 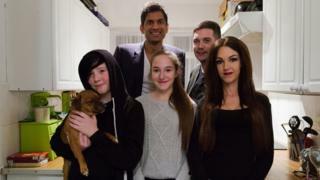 In BBC One's Doctor in the House, I try to help 34-year-old Emma Gleeson, who has been experiencing anxiety, depression and panic attacks for many years. She was 19 when she really began struggling with mental health. Following a severe episode of pneumonia, she ended up in intensive care in a coma. When she woke up she was petrified. She developed an extreme fear of death, and this can precipitate her panic attacks. During an attack, Emma feels terrified, and can often scream out loud. It is extremely worrying for her family and can be scary to onlookers. Emma has tried various medications and counselling therapies but was still struggling and getting three to four panic attacks per day. One of the ways in which I helped her was by changing her food choices. Despite being sceptical at first, I was able to show Emma the hidden power of food in helping her mental state. "I had been living on a diet of takeaways, fizzy drinks and general processed and convenience foods for as long as I can remember, and didn't for one moment think that what I ate was contributing in any way to the anxiety and panic attacks I'd been experiencing for years," she said. "Since meeting and spending time with Dr Rangan, he has changed my entire outlook on food, and why certain foods were potentially having a negative impact on my mental health. "I now only buy and cook with fresh food, I make my own stocks, I eat plenty of fish and I try to reduce the amount of sugar I consume. "I feel so much better and intend to keep this up." The evidence of food's link to mental states has been growing. A landmark 2015 article in the prestigious Lancet journal stated that nutrition may be as important to mental health as it is to cardiology, endocrinology and gastroenterology. Plus, a small but important interventional Australian study from earlier this year showed that a modified Mediterranean diet significantly helped many patients with severe depression within 12 weeks. Unfortunately, this has not translated into routine patient care and most doctors still do not discuss food with their mental health patients. Many of us do not think about how food can impact the way we feel, but we all know the feeling of using food as a quick pick-me-up. When we are feeling a little tired, a little stressed or a little low, we often reach for a sugary snack to help us feel good in the short term. But, this can actually make things worse in the long term. The food you are eating is literally "shocking" your body. By changing her diet, as well as reducing her alcohol intake, Emma experienced a reduction in anxiety, an improvement in mood and fewer panic attacks. She also described feeling mentally stronger, having a clearer head, more energy and a greater ability to cope with stress. It has also encouraged her to be more active and do more things at weekends, which also helps her mental health. Of course, there can be many other factors to consider with mental health problems and it is always worth getting advice from a qualified healthcare professional. There can be many other important factors to consider with mental health problems, such as emotional trauma and stress, but we should not underestimate the power of changing our food to improve our mood. Sugar, food that contains sugar, or even food that is converted quickly into sugar, such as many breakfast cereals, cause your blood sugar to rapidly rise. Within two to three hours your sugar levels then start to fall. At this point, you may not only feel hungry, you can feel "h-angry" as well - hungry and angry. Low and falling blood sugar levels can cause a rise in your body's stress hormones, cortisol and adrenaline. This can have a negative impact on your mood. This is an essential nutrient for brain function and may protect against anxiety and other psychiatric disorders. Foods high in Omega-3 fats include fatty fish (salmon, mackerel, anchovies), grass-fed meat, seeds and leafy vegetables. Tryptophan is an amino acid the body converts into serotonin, your feel-good neurotransmitter. Eat them with a healthy carbohydrate source such as sweet potatoes, which helps to transport more tryptophan into your blood. Some scientists refer to the trillions of gut bugs that live inside us, the gut microbiota, as the brain's peacekeepers. It is thought that having a healthy population of gut bugs can have a significant influence on your mood via the gut-brain axis. The prebiotic fibre contained in vegetables help your gut bugs to proliferate, so the best way to maintain a healthy population is to increase your intake of vegetables, as well as fermented foods such as sauerkraut. Best options are leeks, onions, garlic, artichokes and cruciferous vegetables like broccoli and cauliflower. You have the ability to improve the way you feel by controlling what you put on your plate. See how food can impact mental health on Doctor in the House, Monday, 21:00 BST on BBC One.